Yard ramps allow companies that do not have permanent ramps to still send and receive shipments. 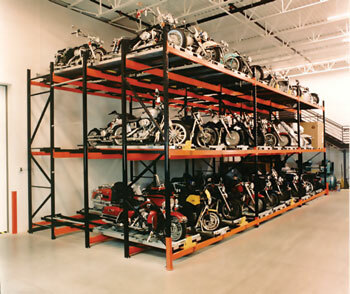 Often times docks do not have ground access which makes it almost impossible to efficiently transfer goods to and from the truck to the warehouse. Yard ramps provide the solution to such situations. Yard ramps are extremely durable, made from heavy duty carbon serrated steel. However, there are other durable materials out there. What makes serrated steel the best option for yard ramps? Serrated steel is the perfect material to build yard ramps because of its year round usage. Serrated steel is a material that can counted on in the extreme cold and extreme heat. Consider other materials such as wood. Wood expands and contracts much more easily than steel. If your yard ramp were out of wood, it would expand in the summer months and contract in the winter. This leads to an unreliable and imprecise yard ramp. These small adjustments are hard to account for and even a small imperfection in length can pose a major safety issue. Steel, like wood, expands and contracts, but at much higher extremes in terms of temperature. Serrated steel also provides better traction than wood, plastic, or rubber. This ties in with serrated steel being a year round option because of its traction in rain. Wood and especially plastic can become extremely slick during rainfall. Forklifts carrying pallets across the ramp won’t be able to grip the surface properly. Even rubber can become slick with enough rainfall. Serrated steel, on the other hand, provides a textured grate that allows for better traction regardless of how wet it is. Forklifts can easily traverse a rain covered serrated steel yard ramp due to the textured material. Serrated steel is an incredibly durable material. Yard ramps and loading docks take a lot of punishment. Other materials, such as wood or plastic, might crack, chip, or break if too much stress is placed on them or if a product is dropped. Rubber is easy to cut and gouge, leaving behind unexpected bumps and holes. The serrated steel might scratch or dent, but the odds of it breaking are very slim. For more information about serrated steel yard ramps, contact Medlin Ramps online or give us a call at 877-4-MEDLIN.